Shaw resilient flooring is engineered to last. Shaw luxury vinyl tile floors imitate the texture and colors of natural materials such as wood and stone. Shaw's luxury vinyl flooring in not only beautiful, but also strong and durable. Their LVT products are moisture resistant as well. Vinyl flooring installed in high-traffic commercial areas such as shopping malls, schools, and hospitals often come with ten or fifteen years of warranty. Residential vinyl floors have quality standards very similar to industrial ones, so its safe to say it will last you at least a couple of decades. 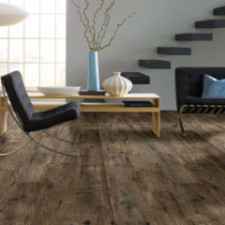 Vinyl planks are produced in a way that makes them water, stain, scratch and scuff resistant, which makes for a very durable floor that takes a lot of time to wear out.